Hello Dear Cooking Friend and welcome to my comforting and hearty Vegetarian Stew with Marsala and Cream Cheese recipe. I try to make at least one meatless dinner each week. And it’s usually the case that our vegetarian meal falls on Monday. Not for any necessary reason. Just because the words “meatless” and “Monday” have been fused together for me over the past few years from reading Kalyn’s Kitchen‘s regular Meatless Monday article on BlogHer and, more recently, from becoming a contributor to Kalyn’s Meatless Monday Pinterest Board. 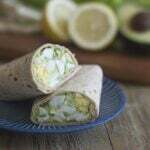 Because “meatless” and “Monday” are linked in my brain, I write “Monday” on my weekly meal plan and vegetarian ideas fall to my paper like leaves from an October tree. And since it will be October tomorrow, those ideas have to be comfy and cozy ones; I want to fill up my Dutch oven with braises and stews, even on Meatless Mondays. I came up with this hearty vegetarian stew recipe so that I could have a soothing comfort food on Monday while also keeping it meatless. This stew is quick to make (since there’s no meat to cook slowly). It gets its rich deep flavor from really browning the vegetables that go into it. And from some marsala and cream cheese too. 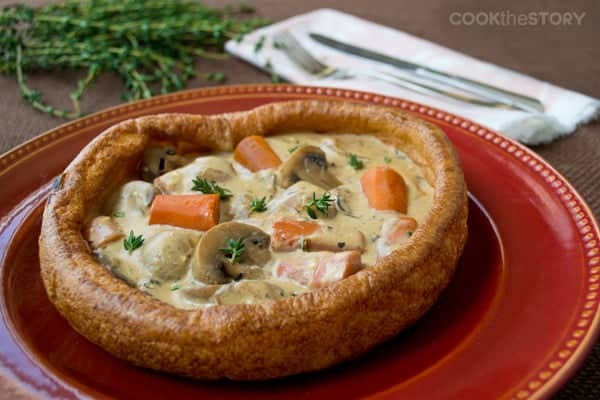 I’ve served this vegetarian stew in a Popover Bowl. Have you seen these popovers in your grocery store’s freezer section? They’re from East Riding Farm and contain only wholesome identifiable ingredients, all of which I can find in my own kitchen and use all the time (think flour, oil, eggs, salt). You bake them from frozen for a very short time (around 4 minutes) and then they’re the perfect vessel for stews like this one. If you can’t find the popover bowls, you can buy round breads and hollow them out. Another thing you could do instead is to make some easy crunchy croutons. That’s what I did when wanting to replicate Panera’s Broccoli Cheese Soup. I didn’t want to have to hollow out bowls and so I made really tasty croutons instead. 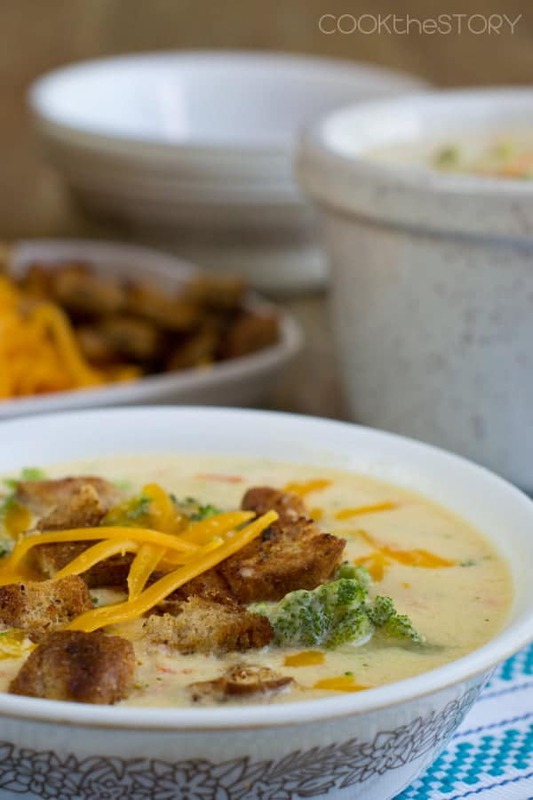 Here’s my recipe for Broccoli Cheddar Soup. And now, here’s my hearty vegetarian stew recipe. This vegetarian stew is full of earthy fall flavors. The flavors are developed by allowing the vegetables in the stew to really brown. Marsala and cream cheese and richness. Bake the popovers according to package instructions. Warm the olive oil in a Dutch oven or large pot over medium heat. Add the carrots and onions. Stir once to coat everything in the oil and then leave it alone until it has started to brown, 2-4 minutes. Stir and then leave it alone until more browning has happened, 2-4 minutes. Stir in the mushrooms. Leave it all alone until the undersides of some mushrooms are brown, 3-4 minutes. Add the garlic, the sprigs of thyme, the flour and 1/2 teaspoon of salt. Stir it for 30 seconds before adding the marsala. Scrape at the bottom of the pot to help the marsala lift up any of the brown bits there. Add the vegetable stock and increase the heat to high. Bring the pot to a boil and then reduce heat to low and simmer until the carrots are tender, 5-10 minutes and the liquid is nearly a stew thickness. Reduce heat to medium. Stir in the cream cheese. Once it has melted through, taste and mix in more salt if needed before spooning the stew into the popover bowls. 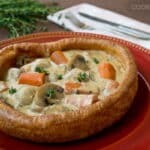 I've served the stew in a premade popover bowl which makes the simple stew into a special meal. **If you don't have or don't want to use marsala, measure 2 Tbsp. red wine vinegar or balsamic vinegar into a measuring cup. Add enough water or stock to make up 1/2 cup and use that instead. I’m always on the lookout for more vegetarian comfort food ideas. 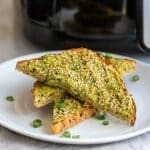 Please scroll down to the comment section and tell me all about your best recipes. Disclosure: East Riding Farm sent me samples of their product to try. I liked this product so much that I wanted to tell you all about it. Beyond the samples, I was not compensated by East Riding Farm in any way. 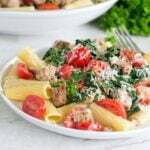 Just made this for dinner, and it was fantastic! I was out of cream cheese, so I substituted a couple tablespoons of cream. Delicious. Thanks so much for letting me know! I’m delighted that you liked it. I enjoy different kinds of soups/stews, that aren’t always tomato based. This one was a nice change. It was healthy and flavorful, however I used Balsamic vinegar since I didn’t have marsala, and it turned out a bit sweet for me. I will definitely make it again, but with actual marsala next time. The cream cheese in the stew gave it a nice flavor. It made enough for myself, my husband, and some leftovers. The veges cooked perfectly. This looks amazing! 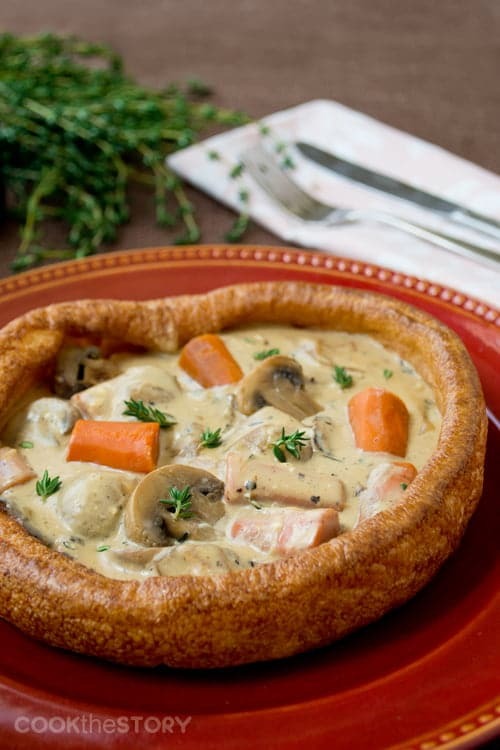 I never heard of the popover bowl before but you’re right, it looks perfect! Wow, this soup sounds delicious. I have never seen those bowls. Probably because I rarely wander down the frozen food aisle, but they look delicious. I love popovers. Mmm … this looks wonderful. And, I could use Tofutti vegan cream cheese to make the dish vegan. It looks like true comfort food. Thanks for sharing! Marsala, cream cheese, and a bread bowl – I’m in stew heaven!! !